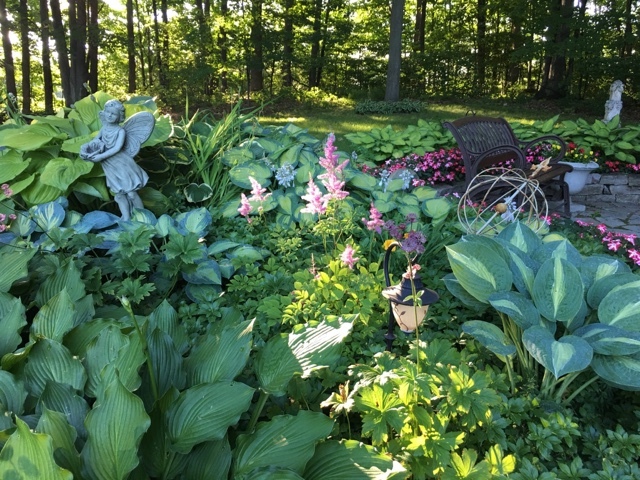 I could see the sun highlighting the pink Astilbe from the kitchen so I sped outside to take a picture. This one is called Amethyst. Creeping Jenny has found it's way around my gardens and likes to creep along the stone walls. You can see it on the ground in this picture. Tucked down in there is a daylily called Orange Buttons. It needs full sun and don't ask me why I planted it here. I should move it and give it a better home. 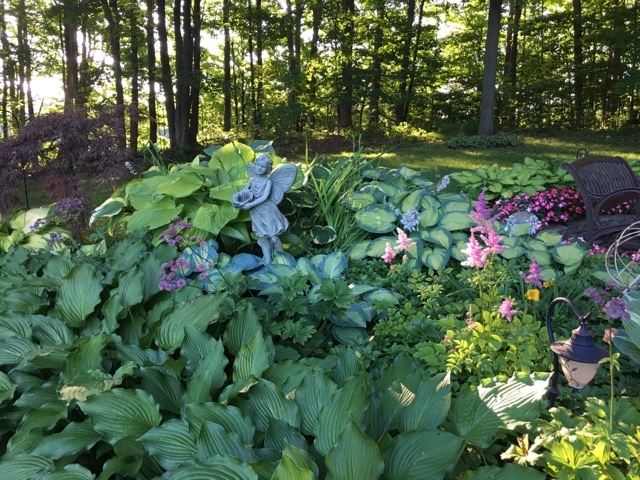 The hosta behind it is called Bright Lights. I've had it for years. The ones that follow the curve of the fountain area are called Gold Standard. Both of these have been super reliable. 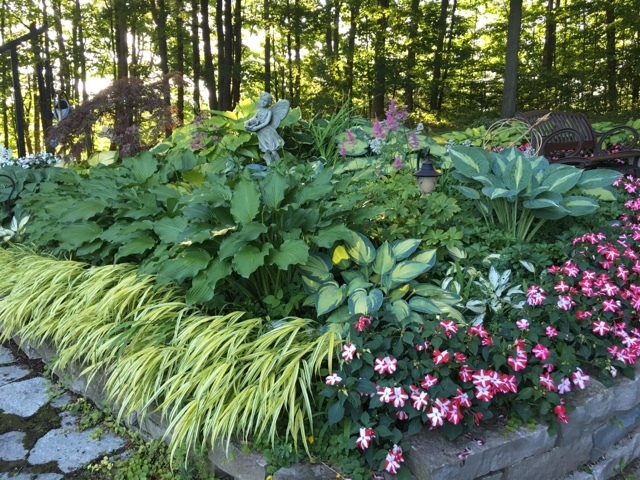 The giant Sum and Subtance Hosta never failes to amaze me. 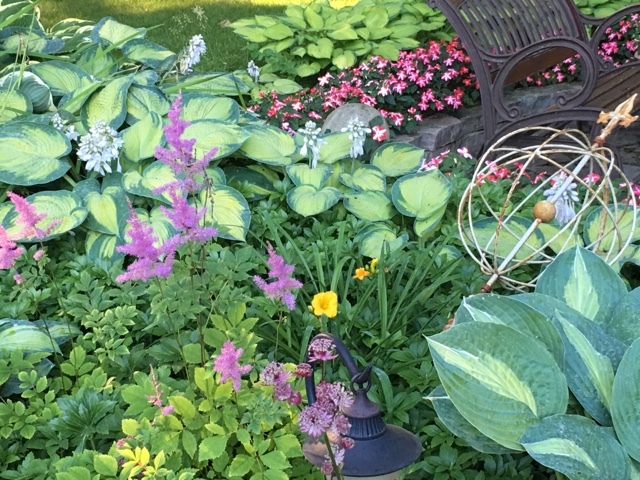 The pink plant in front is called Astrantia (Great Masterwort) Star of Fire. 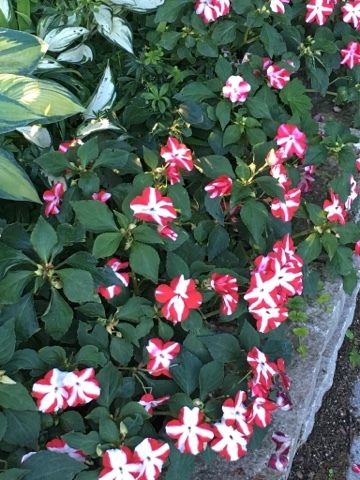 These bi-color impatiens seemed to take forever to amount to something but they finally are now. The Japanese Forest Grass Aureola (Hankonechloa) took a long time to fill in. Several years back I split it up to spread it across this whole area and then it seemed to take years for it to amount to anything. It does like to be well watered so I don't recommend it if you aren't good about watering. 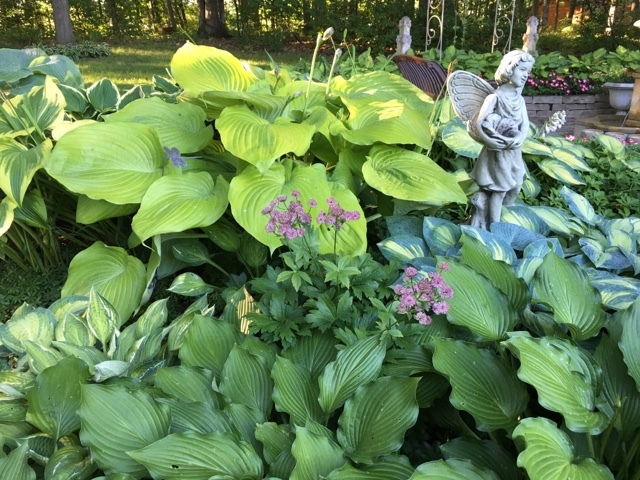 The dark plain green hosta is called Fujibotan. I wanted to create a consistent color to be next to the Japanese Grass. 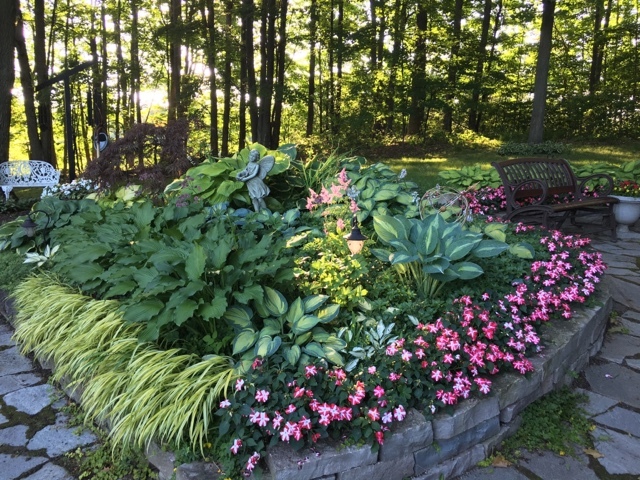 The little wagon of white impatiens is getting real nice and full now. I hung a watering can on a shepard's hook near it. This is beautiful, Liz! You definitely have a green thumb! 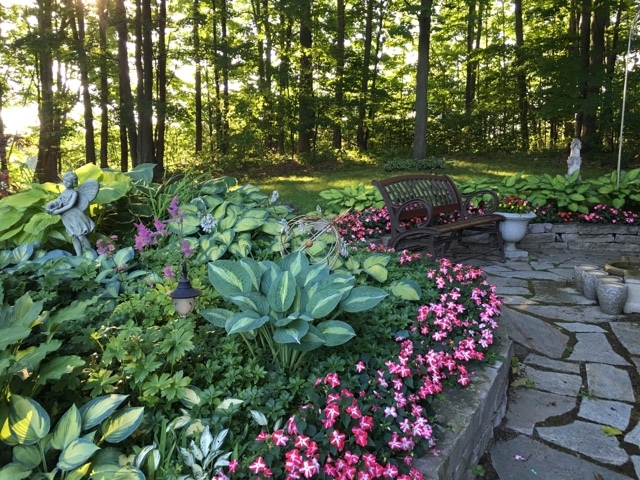 Your garden is really beautiful right now!! 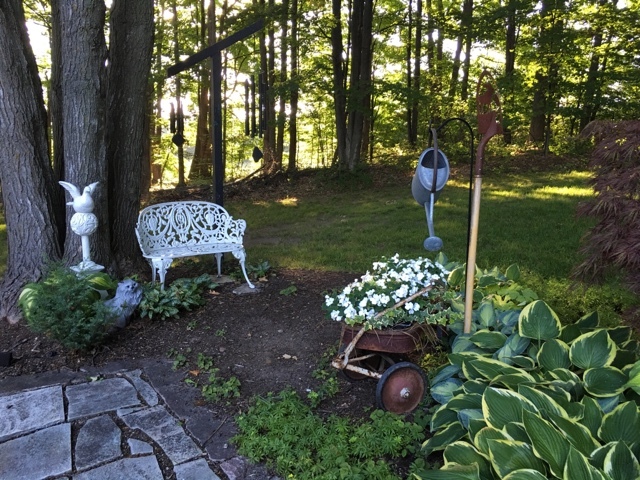 Liz, Your garden looks fantastic! I really love the Japanese grass. 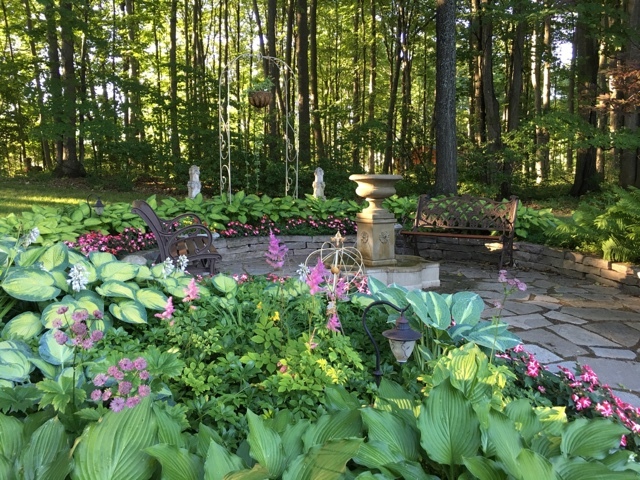 Today - in view of the ugliness of France - I needed to step in in your beautiful garden and enjoy. And be inspired by its beauty and hope. I knew it would soothe me. It did. It always does.